All right, let’s start the list with Rothenburg, because I think we can all agree, this is one of the most charming towns on the planet! This pretty town is located within an easy drive of Munich, Nuremberg, and Stuttgart—but trust me, you’ll want to spend at least a day wandering around the cobblestone streets of the well-preserved medieval town. You can see the whole Altstadt (old town) from the top of the Town Hall Tower, which I recommend doing early in the morning, before the crowds really set in. Then, spend the rest of the day getting lost down the countless alleyways! Not only is Rothenburg well-connected to other southern German cities, but it has some of the best-preserved medieval architecture in the whole country. The 14th-century walls are still intact (although they did suffer some damage during WWII), and you can even take a walking tour of them. Plus, there’s the historic Marktplatz (market square), the Medieval Crime and Punishment Museum, and plenty of other attractions that should more than keep you busy! Definitely don’t miss St. Jakob’s Church with its 500-year-old carved wooden altarpiece—one of the finest examples of craftsmanship in Germany. Rothenburg ob der Tauber, Germany © Shutterstock, Inc.
One thing to note about Rothenburg is that it gets a crazy number of tourists every year, especially during the summer months and December, when tourism is at its peak across Germany. But nearby Dinkelsbuhl has all the charm of Rothenburg without all the people elbowing you out of the way to take that perfect picture! The town has an interesting history as it was accepting of both Protestants and Catholics during the Reformation—and it’s just a quaint little place with half-timbered buildings and window boxes galore! Again, despite being one of the major stops along the Romantic Road, Dinkelsbuhl is far less crowded than Rothenburg. What this translates to is, you’re able to get prime people-watching seats at a street-side café. There’s no better way to experience German culture than watching everyday life happen before your eyes as you sip an afternoon coffee and enjoy a pastry or two. The town also features a number of different architectural styles, including Gothic (St. George’s Minster), late Roman (St. Paul’s), Rococo (the chapel in the Castle of the Teutonic Order), and more—so definitely get your camera ready to snap some shots! Dinkelsbuhl, Germany © Shutterstock, Inc.
Let’s jump up to the northern part of the country and talk about another medieval city: Lubeck. This city has one of the most extensive Altstadt, or old town, areas of any northern German city. Today, it’s still guarded by its iconic 15th-century red brick gate, and you’ll find plenty to love from the medieval city-center to the bustling Baltic Sea port areas. There are six churches in Lubeck’s medieval quarter, and inside you’ll find some impressive examples of northern German ecclesiastical art. You’ll also want to check out the two city gates that have survived into the modern era, plus the old Rathaus, or town hall. But what I especially love about Lubeck is that it’s right there by the sea—don’t forget to view the ships at the Museumshafen or take a boat ride around the city! And you definitely need to try some of the marzipan that the city is famous for. Lubeck, Germany © Shutterstock, Inc.
Meissen is one of the oldest towns in Saxony, so you definitely shouldn’t leave it off your itinerary! On first glance, the town actually looks a lot like Prague, thanks to its red roofs with the castle and cathedral set up on top of the town. But the culture of the town is uniquely German. What the town is really known for is its porcelain, which started being produced in the town in the early 16th century and which is still in production today. Albrechtsburg, Meissen’s castle, dates to the 15th century and is considered to be Germany’s oldest castle. The Gothic architecture of the castle is very unique and well-worth a look. Next to the castle, you can also check out the Gothic cathedral—which frequently hosts classical music concerts! But the main attraction is the Meissen Porcelain Museum, which will tell you all about the town’s history as well as allow you to attend hands-on demonstrations. You can also browse shop after shop selling all sorts of different porcelain wares—so you should have no problem finding souvenirs for everyone on your list! Meissen, Germany © Shutterstock, Inc. This town is located in the south of Germany, right on the border between Germany and Austria and right on the picturesque shores of Lake Constance (German: Bodensee). Pretty much anywhere you walk along the water, you can look out and see the Alps off in the distance—at least, you can if your eyes aren’t glued to the half-timbered houses and historical buildings of Lindau itself! Lindau is a popular summertime resort, and with good reason! The lake stays pretty cool year-round, but that makes for a refreshing swim on those hot days. You’ll also have the chance to take boat trips on the lake, go hiking (I recommend heading to Bregenz and hiking up until you get a view of the lake), rent bikes, and otherwise participate in a plethora of outdoors activities. And oh yeah, did I mention that the town itself is incredibly beautiful? Your camera is going to be working overtime here for sure. Lindau, Germany © Shutterstock, Inc.
You can’t go to Germany and not visit the Black Forest! And although it might seem like there’s not much to do in a town as small as Triberg, you’re in for a surprise! Not only is the town itself charming, but it’s also a great place to learn about the history of the Black Forest area as well as to indulge in some outdoors activities (and some of the famous Black Forest cake—heaven in dark chocolate and cherry form!). Soak in the cute town first, and then head over to Triberg’s Schwarzwaldmuseum, or Black Forest Museum. The place has a ton of artifacts, including many of the famous Black Forest cuckoo clocks that the region is known for. (Once you’ve finished there, head over to the House of 1000 Clocks where you can browse through different types of clocks—and buy traditional cuckoo clocks at a great price!) But also not to be missed is the quaint main street of town, and the nearby Triberger Waterfall, Germany’s tallest waterfall, which stands at an impressive 535 feet. There are a few different hiking trails in the area that will take you straight there. Triberger, Germany © Shutterstock, Inc.
Triberger Waterfall, the highest waterfalls in Germany © Shutterstock, Inc. Although you might be a bit put off by the name of the town, Worms (pronounced vorms) is one of the oldest cities in Germany. It’s located right along the River Rhine, which is about as romantic as it gets, although it may not have the half-timbered houses of some of the other entries on this list. In fact, the town is famous as the setting of many medieval legends, including the Nibelungenlied about the hero Siegfried—so in my books, it definitely ranks amongst the top fairytale towns in the country! Worms has been a religious city for many centuries. It’s 12th-century cathedral can be seen from all over the city—but the city is also home to the oldest Jewish cemetery in Europe. You also can’t miss the Nibelungen Bridge and tower. But the smaller attractions are where the real charm is at. Pay a visit to the Liebfrauen Church, which is set amongst sprawling vineyards producing the delicious Liebfrauenmilch. Take a stroll along the Rhine or through the park surrounding Schloss Herrnsheim. You’re sure to find the fairytale beauty in every turn. Cathedral of Worms, Germany © Shutterstock, Inc.
Martin Luther Memorial in Worms, Germany © Shutterstock, Inc. The oldest Jewish cemetery in Europe. Worms, Germany © Shutterstock, Inc.
You’ve undoubtedly seen pictures of St. Sebastian’s Church, located in Ramsau—they’re frequently on the covers of German guidebooks and brochures. And you’ve probably also seen pictures of the nearby Hintersee Lake. Or perhaps you’ve seen pictures of the fall festival, Almabtrieb, when the cows are brought down from the summer pastures for the cold winter. If you’re looking for a quaint, alpine village to spend your days in, look no further than Ramsau. 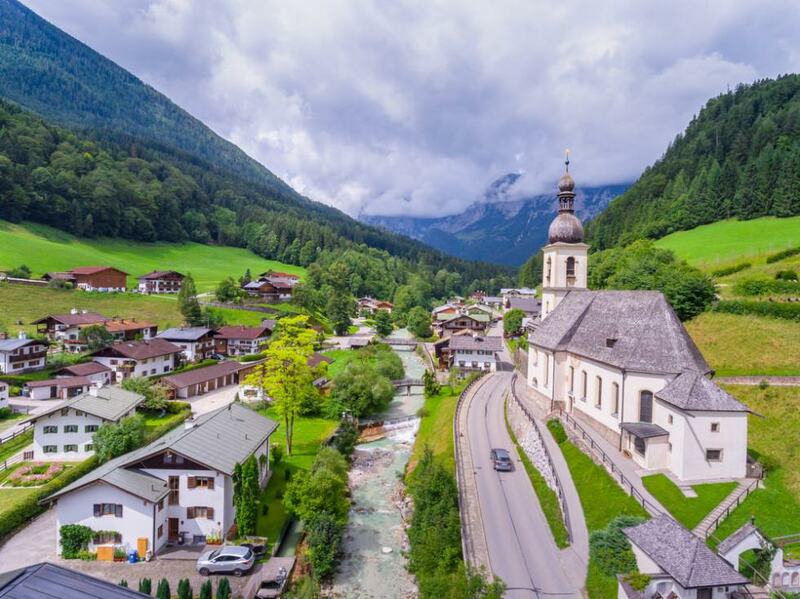 Although Ramsau is home to only about 3000 people, there are tons of things for you to do in the area—just check out this guide. 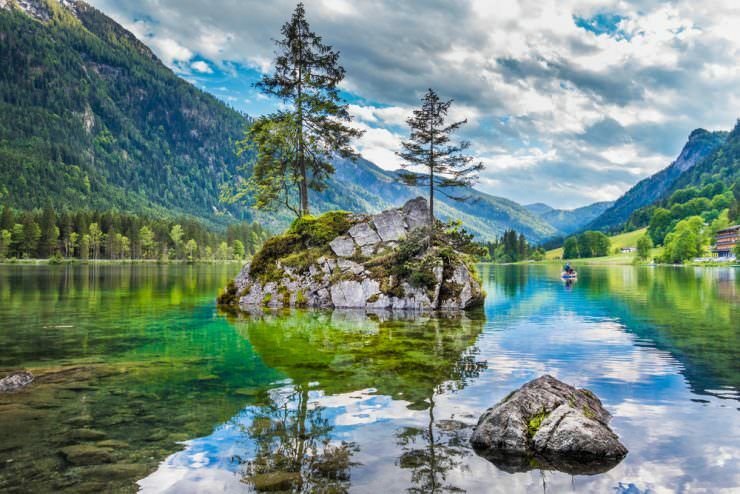 Whether you like hiking, skiing, swimming, star-gazing, or just relaxing and feasting on German food and drink, Ramsau is the place for you. And oh yeah, that church looks beautiful and straight out of a fairytale no matter what time of year it is. Parish Church of St. Sebastian in the village of Ramsau, Germany © Shutterstock, Inc.
Ramsau, Germany © Shutterstock, Inc.
Hintersee Lake, Ramsau, Germany © Shutterstock, Inc.
Bamberg became a UNESCO Heritage City in the early ’90s, and it’s easy to see why, given the medieval architecture that’s present in the old town. The city is spread over seven different hills, and it’s known for its arched bridges and the old Rathaus, which is perched on one of these arched bridges over the river. You’ll find many different styles of architecture here, from medieval and half-timbered to baroque to modern. One of the main sights to see in Bamberg is its unique Rathaus, but you’ll also find similar fairytale-style buildings in the Alte Hofhaltung (Old Court), which was once home to the bishop. Speaking of bishops, don’t miss the 11th-century cathedral. And if all the architecture isn’t doing it for you, Bamberg is well-known for its numerous breweries, including the 15th-century Schlenkerla brewery, which make a type of smoked beer that isn’t made anywhere else in the world. Grab a tankard…er, glass…and some wurst you might feel like a knight from olden days! Bamberg, Germany © Shutterstock, Inc.
Bad Mergentheim is another pretty town where you’ll find quaint, cobblestoned streets and lovely half-timbered buildings. Also, as with all German towns that have ‘bad’ in the name, Bad Mergentheim is a spa town—and its waters have supposedly been curing people of various ailments for many centuries. I think everything about this town, from the history to the architecture, is absolutely lovely—and best of all, it’s a bit off the main tourist track! Bad Mergentheim, Germany © Shutterstock, Inc.
Of course, this is only a small selection of the fairytale towns that you’ll find scattered across Germany. Have you visited others? What were your favorites and why? Tell us about them in the comments below!